Posted December 12, 2016 by jordannet66 & filed under Blog. Colourful: if James Stirling or Terry Farrell did Mansard lofts, they would look like this one. Image by RedTC (via Shutterstock). In the field of loft conversions, there are three main types of conversion styles. One is the dormer roof conversion, the most commonplace variety. Another one is a hip to gable conversion. With this style, part of a hipped roof is converted to a gable roof. The third one, that we are focusing on for this post, are Mansard lofts. 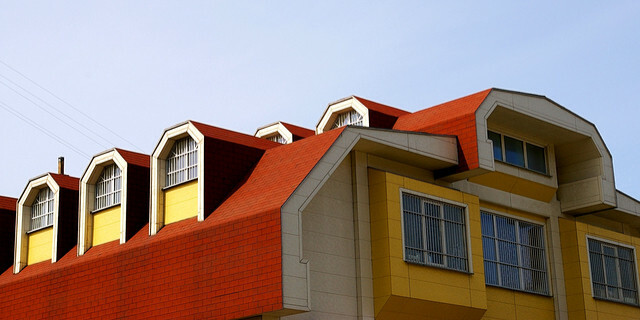 In Europe, Mansard can also refer to the attic type as well as the roofing type. Its steep angle makes the roof ideal for adding extra space. In many office blocks, Mansard lofts form part of a penthouse style suite. Likewise with hotels and apartments. They are a popular choice for adding space to historical buildings without straying too much from the original design. For homes, Mansard lofts offer the most space but they are the most expensive form of loft conversions. The change of roof pitch allows for full height ceilings, which is good for adding extra bedrooms, living space, a study or a man cave. In the right area, they can blend in with the rest of its surroundings. Mansard lofts are best for full length loft conversions that cover the whole side and length of a roof. Where full height ceiling space is a priority, the Mansard roof is preferable to dormer roofs. A gable conversion could be useful for extending roof space at the sides. Unless you want the whole of your roof converted to a Mansard roof, part of your hipped roof could have a mansard loft conversion. Up Another Level, 12 December 2016.